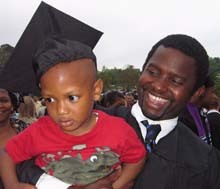 Commencement regalia are provided at no additional cost. The Reinhardt Bookstore coordinates orders and distribution of regalia. Please order your regalia from www.herffjones.com/college/reinhardt no later than Monday, March 18, 2019, to ensure timely delivery. You have through March 18, 2019, to order custom-fit caps and gowns. Cap and gown orders will be handed out from 9 a.m. – 5 p.m. from Monday, April 15 – Thursday, May 2 in the Reinhardt University Bookstore (bottom floor of the Hasty Student Life Center). Caps and gowns will NOT be distributed at baccalaureate or graduation, so please make sure you have picked up your regalia by the dates/times listed above. For all graduates, comfort is the key. You will wear only the gown for baccalaureate and both the cap and gown for graduation. If you are a male, we suggest that you wear a dress shirt and tie, black or navy blue pants and dress shoes under your graduation gown. If you are a female, please wear a dark skirt, dress or pants and dress shoes. *There will be a considerable amount of walking and some climbing of steps, so please wear appropriate shoes.